Announced at a press conference alongside the ribbon cutting ceremony at the DRIVETHEARC Station at Raley's in El Dorado Hills, Calif. – which will host four DRIVETHEARC EV fast chargers – dignitaries from NEDO, Nissan, Kanematsu, EVgo and various California state government offices gathered to share details of the fast charging corridor and its potential impact in forwarding EV adoption in California. The project to collect and analyze data will be completed in September 2020, while installation of the 50 fast chargers along the corridor is expected to be completed by March 2017. This will provide drivers with multiple fast charging points per site at the more than 20 high-traffic locations that are part of the project. "NEDO is committed to its best efforts to realize the objective of the demonstration project with Go-Biz and other California government agency (CEC, CARB, CalEPA, CPUC) support, EVgo's cooperation as the local partner, and through Nissan and Kanematsu's expertise and partnership in the execution of this project," said Makoto Watanabe, Executive Director of NEDO. "We would like to contribute to solving environmental problems by promoting EV use, which will lead to reduced greenhouse gas emissions, and truly hope that we will be able to help create sustainable EV societies in the future." "This network of convenient fast-charging stations will make it easier for more consumers to choose fun-to-drive and economical electric cars," said CARB Chair Mary D. Nichols. "NEDO's investment in DRIVETHEARC will make intercity EV travel a breeze, and by putting more zero-emission vehicles onto our roads and highways, will help California meet our clean air and climate targets." "We are incredibly excited to see the DRIVETHEARC project come to life, executing the MOU signed by NEDO and GO-Biz to help build an infrastructure that supports California's ambitious goal of putting 1.5 million zero emission vehicles on the road by 2025," said GO-Biz director Panorea Avdis. 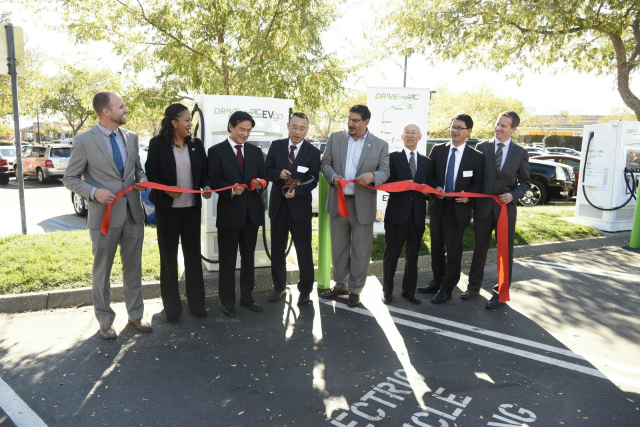 "We commend NEDO, Nissan, EVgo and Kanematsu for their commitment, collaboration, and execution and look forward to continuing our work together to build the California ZEV market." As the global leader in EV sales, Nissan is also partnering in DRIVETHEARC as part of the automaker's 'Infrastructure for All' strategy. Nissan has played a leading role in growing the number of EV fast charging stations in the U.S. from 250 stations in 2013, to an anticipated 2,000 stations by 2017. This provides Nissan LEAF drivers with access to the largest metro area network of fast charging stations in the country. The DRIVETHEARC corridor enhances the existing EV infrastructure Nissan has supported as part of its No Charge to Charge promotion, by connecting the metro areas of Monterey, the San Francisco Bay Area, Sacramento and Lake Tahoe. "Nissan is determined to widely spread EV use to help benefit the environment on global basis. The U.S. is among the top markets in the world for EV sales, and California represents a staggering 40 percent of all EV sales in the country, making the state the catalyst for furthering the adoption of EVs into the future," said Hitoshi Kawaguchi, Chief Sustainability Officer of Nissan Motor. "An adequate public charging network is one of the key factors for EV expansion. Northern California has a diverse geography but until now did not possess a true inter-city EV fast charging network. We are excited to implement this network and study EV use in Northern California so that we can apply the lessons we learn to future fast charging network projects around the world." As a global trading house with expertise in the electronics and information technologies business, Kanematsu has been collaborating with Nissan and EVgo to release the new DRIVETHEARC smartphone app. The DRIVETHEARC smartphone app is designed for the DRIVETHEARC stations and the EVgo stations. It navigates EV drivers to optimal stations based on cruising range and charging station status. The app enables EV drivers to monitor the real-time status of the charging stations, select an appropriate station, and charge their EVs using the app's authorization process or conventional payment authorization methods. The EV cruising range feature based on NissanConnect Data Link Service will be available in the spring of 2017. As the local partner of the project, EVgo is managing the installation of the DRIVETHEARC infrastructure with the deployment of 50 EV fast charging stations at over 20 convenient locations. Fast charging stations are being installed at key high-traffic retail partners along the route to create a true inter-city charging network that will encourage long-distance EV travel in Northern California. The corridor represents the newest addition to EVgo's national network of over 800 EV fast charging stations across 66 markets. "We are thrilled to have the opportunity to provide the charging infrastructure, expertise and hardware for the DRIVETHEARC fast charging corridor, and to be working with such a fantastic group of global partners on this project," said Terry O'Day, Vice President, Product Strategy and Market Development at EVgo. "Our aim is to encourage the feasibility of long-range EV travel in California and provide EV drivers with a convenient, low-cost inter-city charging network that will pave the way for future EV integration in the state." This is so cool, now if I need to charge my car up, I can go drive to El Dorado Hills, and charge it up there. Pretty soon with all that money coming into Calaveras county from the pot farms here, we'll have one of those charging stations up in Mt Ranch, or close by. I knew all the gangster money would put us on the map sooner or later....we are going to spend it, right? I mean besides on trying to bust the criminals and court cost, and fighting fires which the pot farmers have cost us, I believe the cost of those fires were around 3. something million dollars, but we still have some of it, right? I can't wait to hear on some of the good things all that money will bring us. I'll be waiting here to hear about it.